Rosslyn Riviera mall in Kenya will be constructed at affluent Runda Estate at a cost of US$ 22.4m by a real estate developer. The new mall will be built on a 4.5 acre piece of land in Rosslyn suburb. It will be located near the Northern Bypass and the upcoming Two Rivers Shopping Complex and accessible through the proposed link road from Waiyaki way. Covering 157, 380 Sq feet, the mall will be able to offer its customers various services ranging from dinning, shopping, health, entertainment, as well as wellness services. Rosslyn Riviera mall in Kenya is conveniently located on Limuru Road and will be accessible to residents of Runda, Muthaiga, Kigwaru, Nyari, the UN complex in Gigiri and Ruaka. These areas are traversed by a mix of residents from corporate executives to business owners. 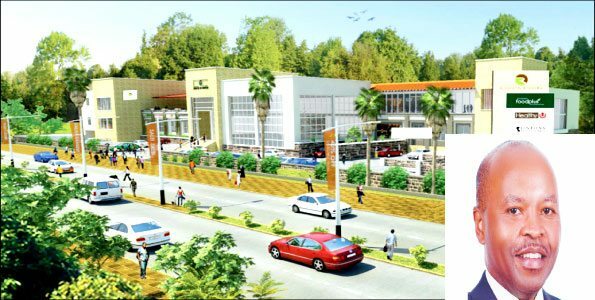 The mall will be constructed by Ben Gethi, who is the director of a number of Nairobi Security Exchange listed companies. The mall is expected to be ready by March 2016. It will have 350 parking bays, and have a family friendly environment. Businesses that have already booked space in the mall include News Café, RAGS, Chandarana Supermarkets, German Point, Bianca Nero, Basic Intimates, and Accessorise with Style, among others. The architect/ designer of this building ought to be more creative. This building looks like the local high school down the road as opposed to a grand mall located in a very high end part of Nairobi! I really hope some rethinking can be done on the facade!